M. Night Shyamalan’s works have had a wide range of quality. It originally seemed as though his output just got worse over time, but in the light of not only the glaring plot holes in The Sixth Sense, but also the fact that some have noted a similarity to an episode of Are You Afraid of the Dark, it may be considered that Unbreakable is Shyamalan’s real zenith of quality. So why is it the movie I’m the least familiar with? 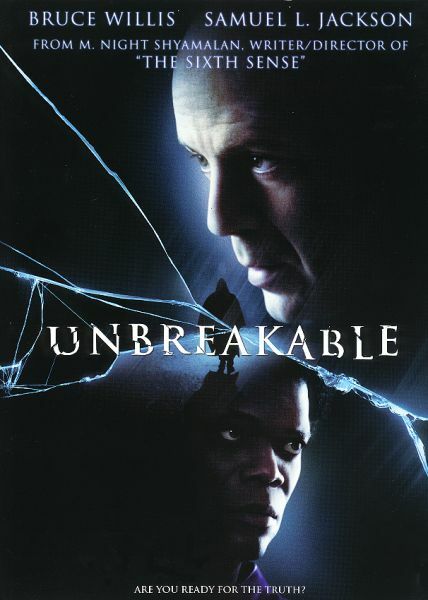 My guess is that while “6th Sense” has a lasting buzz, and I was paying attention to the ad campaigns of the later films, Unbreakable stands in my blind spot. Too old for me to notice, too average to remark on. Here I go remarking on it. From what I understand, it’s a deconstruction of superhero stories. Not terribly original and not well-timed. (Superhero movies were about to have a classical comeback after America went into security blanket mode, but nobody could have predicted that.) All the same, I hear good things about this film, and I expect good things. After a devastating train accident, David Dunn is miraculously the only survivor, completely unharmed. Shortly thereafter he is contacted by Elijah Price, a comic book enthusiast and sufferer of a brittle bone disease, who suggests the possibility that Dunn is one of a small group of exceptional humans who were the seeds of the idea of the modern comic book superhero. With his marriage and his relationship with his son falling apart, Dunn struggles with the question of whether he is more than he thought, and what to do if he is. Bruce Willis flexes his drama muscles in this movie. The presence of his tough guy bald head might mislead viewers into expecting the usual Bruce Willis action movie, but there is only one action scene in the entire film, and it is relatively mundane. I suppose Samuel L. Jackson brings a more pronounced version of the same effect. The role of a mysterious man in a wheelchair giving advice is somewhat creepy in his hands, but you ultimately trust him. What struck me about this film was the use of simple, unusual visuals. Especially in the opening scenes, where something less important is put in front of the action to change the meaning of what is happening. To a lesser extent, the weight-lifting scene also uses visuals heavily. This is the film that set the pattern for “Shyamalan likes twists.” In this case, any other movie that had such a twist I would call a sequel hook, but I feel this is a complete movie that can and possibly should stand alone. It’s not a superhero film, it’s a film about a man who fixes his life while learning he’s exceptional. In that sense, there’s nowhere else to go. See this movie: for the most realistic superhero Origin Story in cinema. Don’t see this movie: looking for spandex costumes.